Matt Taibbi has reemerged at Rolling Stone with the scathing 6000-word story of a former JPMorgan securities lawyer who tried to blow the whistle on massive crisis-era mortgage frauds going on at the bank, only to have the government begin to ignore the case after Jamie Dimon offered a $US9 billion civil settlement last year. Alayne Fleischmann’s story is familiar: as a diligence officer, she was privy to the fact that the bank was bundling mortgages they knew might go bad and selling them to investors as low-risk securities. She knew so much that she became a key witness for a criminal cast that the US Department of Justice was mounting against the bank. And then, shortly before Eric Holder was scheduled to announce charges against the bank, Jamie Dimon made a call. The real crux of this story is that the Justice Department really does have enough to go after specific people for specific crimes committed leading up to the financial crisis and chooses to take giant cash settlements instead. No one has to admit they are guilty. The banks continue to exist as they are. No banker suffers the unpleasantness of going to jail. The ones to get punished, ironically, might be the whistleblowers. Alayne Fleischmann is a Canadian woman who went to work as a securities lawyer on Wall Street after graduating from Cornell Law School. She ended up at JPMorgan in 2006 at the height of the housing market, working as a transaction manager (“a kind of quality control officer” for mortgages that got bundled together and sold off as securities to clients, says Taibbi). But we already knew the banks did this. But here is where Fleischmann brings something new to the table. After this, Fleischmann testified in a deposition that she went to a managing director, Greg Boester, and told him that the bank couldn’t securitize the loans without a special disclosure about them (which would make them impossible to sell). In early 2007, she wrote a letter to William Buell, another MD, about poor job that the bank was doing in its diligence. In 2008, Fleischmann was laid off by the bank. Fast forward to 2012: Fleischmann got a call from the SEC. They wanted to talk about her time at JPMorgan, but after she talked to them they never followed up. But then she was interviewed by the US attorney’s office in the Eastern District of California. This is when, according to Taibbi, Jamie Dimon picked up the phone and offered a civil settlement. It began when Holder’s office scheduled a press conference for the morning of September 24th, 2013, to announce sweeping civil-fraud charges against the bank, all laid out in a detailed complaint drafted by the U.S. attorney’s Sacramento office. But that morning the presser was suddenly canceled, and no complaint was filed. According to later news reports, Dimon had personally called Associate Attorney General Tony West, the third-ranking official in the Justice Department, and asked to reopen negotiations to settle the case out of court. JPMorgan and the Justice Department eventually settled for $US13 billion, although Taibbi also says it was really only $US9 billion. “…$US4 billion of the settlement was largely an accounting falsehood, a chunk of bogus ‘consumer relief’ added to make the payoff look bigger.” Consumer relief, he says, is not paid by the bank, but the investors in the mortgage securities. And even then it’s only paid if the investors agree to it. The Justice Department’s case is still technically open — at the end of the story, Taibbi mentions that a new set of investigators contacted Fleischmann over the summer, and she won’t comment on the ongoing investigation. And the statute of limitations still hasn’t run out for certain crimes, like wire fraud. 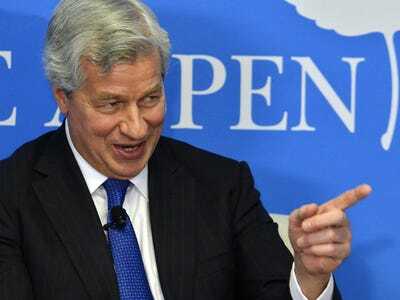 JPMorgan declined to comment to Business Insider. Eric Holder’s office has not yet returned a request for comment.